–I just don’t get how the president of Rutgers University, Robert Barchi, can excuse his months-long delay in firing the men’s basketball coach by explaining that he hadn’t actually seen video of the coach’s deranged behavior until last week. Barchi admits that his underlings had, for months, possessed the damning video, and that they’d fully briefed him on its contents back in 2012. Wasn’t Barchi’s affirmative decision not to view the video when he first became aware of its existence a greater dereliction of duty than his delay in firing the obviously maladjusted coach? –I just don’t get the logic in the NRA’s assertion that the best hope for stopping a bad guy with a gun is a good guy with a gun. What if the bad guy is a better shot than the good guy? What if the bad guy is wearing body armor, and the good guy isn’t? What if the bad guy’s gun is bigger, faster, and more powerful than the good guy’s, and with a larger magazine? Wouldn’t a better, more logical construct be to say that the best way to reduce the incidence of bad guys shooting guns is to make it harder for bad guys to get guns in the first place? And wouldn’t a national mandatory background check, coupled with a national law against third-party purchases and transfers, help to achieve that objective? –And finally (for now), I just don’t get exactly how or when the word “so” became acceptable as a meaningless, interjective sentence starter. From the mundane (last night my server described the restaurant’s dinner specials by beginning, “So as an appetizer, we have . . . .”) to the lofty (last week on “The Daily Show,” Sheryl Sandberg–COO of Facebook, author of the new bestseller, Lean In, and an indisputably articulate and erudite person–began her response to Jon Stewart’s second serious question with, “So what’s happening is that you’re right . . . .”), everywhere, it seems, a gratuitous, unnecessary “so” is finding its way to the start of more and more spoken sentences. Why is this happening? 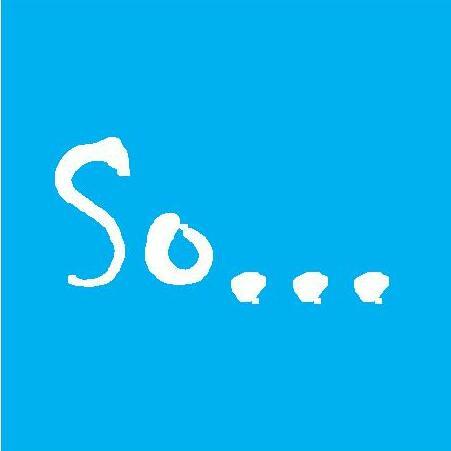 Has “so” become the new “um?” I don’t know. But with perhaps an overly nostalgic appreciation for the artful use of verbiage, I’m hopeful the trend will reverse. How hopeful? So! Love your posts, have you ever tried writing for a wider audience? I’ve never concerned myself with the width of my readers–nor, for that matter, with their height. Extra credit, and a free hall pass!